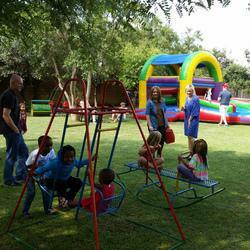 cost Full Day Venue Hire: Saturday R1200.00 Sunday R1000.00 first booking includes a water slide. 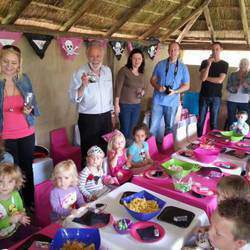 KidzSpot, located at Ngwenya Glass Village Muldersdrift, is a lovely upmarket party venue in the heart of Muldersdrift. We are 15 minutes drive along Beyers Naude from the N1 off-ramp in Roodepoort. The village has a restaurant and the award winning Gilroy’s Brewery, a gallery and some very interesting arts & crafts and trinket shops. There is entertainment for the whole family including off-road dirt carting, zip-lining for bigger 'kids' and candle making for the younger ones. 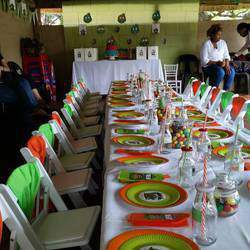 The KidzSpot Party and Function Venue is situated in the gardens under a beautiful old tree which transforms into a party paradise where children and adults can enjoy fun-filled mornings and afternoons. The venues are private and have their own spacious, well-equipped play areas. There is a 5 x 10 m thatched lapa with a braai at each venue and they have their own private toilet and baby changing facilities. Each venue can cater for a maximum of 80 kids and adults combined. Functions for adults / teenagers can be arranged. So be sure to book for your kids party, 18th, 21st or 51st well in advance! !The Lapa can seat 40 Adults if required. Venue can be viewed Tuesday to Sunday unattended, up the Ngwenya driveway on the left towards the go cart racing.